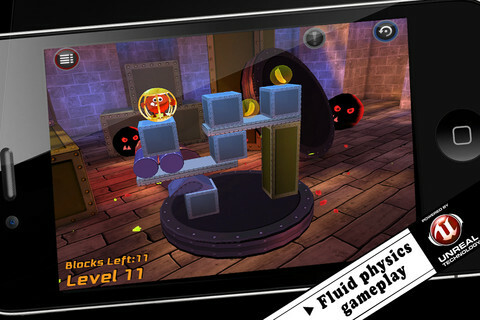 Bring Me Down is a really polished 3D puzzle game for the iPhone. But that's not what makes it fun. What makes it , and any game for that matter, fun is the game mechanics which were done really well. 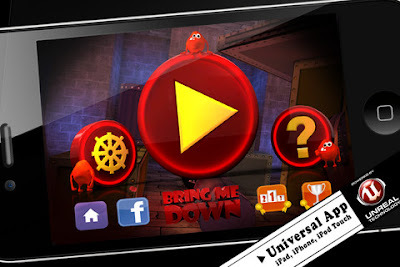 The goal in Bring Me Down is to get the cute creature down to the bottom level by breaking away the boxes and other blocks that are holding it in the air. When you tap a block it pops and disappears and then things start falling. If the creature falls off the side of the table, you're done. The trick is to figure out which blocks to pop when, in order to make the structure fall apart in a way that won't cause the little guy to roll off. If you play in easy mode your creature is enclosed in a square cage which doesn't roll off the table as easily. If you go for hard he's stuck in a round cage that starts rolling as soon as it's not on level ground. For extra points try to save all the bananas too, it's not as easy as it may sound. 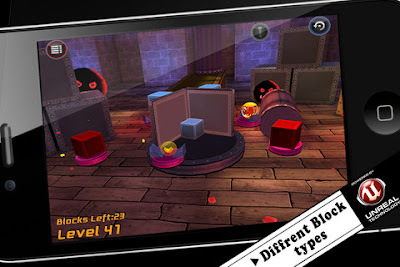 As you progress in the game the structures become more and more complex and the blocks start moving, exploding, and make your life more difficult. The game is free for today and is a universal app that you can also play on your iPad.